Often referred to as ‘Neighbourhood Watch’, the Homewatch Scheme is aimed at reducing crime in a particular neighbourhood. It also helps with awareness of specific issues that might be affecting your local community, and how best to prevent certain crimes from occurring. By being more vigilant and working together as a community, it reduces the potential for crime and is one way to Make Your Neighbourhood A Nicer Place To Live. In addition to the obvious principles of the scheme outlined above, it also has many other benefits. By working together as a ‘team’, you’ll no doubt get to meet neighbours whom you may never have really bothered to get to know previously. You’ll gain more reassurance from knowing that others will be keeping an eye out for you, just as you will be for them. This can be a comfort to all, but will be a great way to Help The Elderly, frail and disabled people in your area. And, as you’ll hold regular meetings, this will also bring a social element to the scheme. 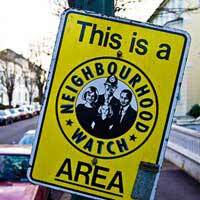 While crime is a serious matter, a Neighbourhood Watch scheme doesn’t necessarily have to be all about gloom and doom. It’s also an opportunity to extend the meeting once the relevant issues have been discussed, and to socialise with other members of the community, and even forge friendships. As an offshoot of that, you’ll find that neighbours tend to co-operate with each other far more. There are far fewer disputes, arguments and disagreements within communities which participate in such schemes. Furthermore, because your local community police officer will be there to support you, you’ll also have advanced knowledge of the general crime trends within your community. This will mean that you’re better prepared and you’ll be able to report back any incidents or areas of concern that directly affect your neighbourhood, which the police may not be all that aware of. The police officer will also be able to advise you on practical solutions to keeping both yourself, your home and all of your possessions more safe and secure. As a privilege for taking responsibility and setting up a scheme, you might also be able to benefit from price reductions of security related devices, such as alarms, certain locking devices and other equipment. You might also find that you get cheaper home insurance as a direct consequence of being a member of a Neighbourhood Watch Scheme. Can Younger People get Involved too? Teenagers should especially be encouraged to play an active role within a Neighbourhood Watch scheme. In fact, these days, they are possibly far more likely to have a ‘handle’ on what’s going on in your community, as they tend to get out and about a lot more than many adults do. They are also more in touch with the issues which are affecting young people, which sometimes can lead to crime, and they may be able to offer suggestions on why certain crimes occur and what could replace a youth’s desire to commit crime. Teenagers will also benefit from police advice on the dangers of things like drugs and alcohol misuse, and how to deal with issues such as peer pressure. Entire communities can get involved in these schemes, which will not only deter crime but will also educate and inform the participants. Neighbourhood Watch has its own website where you can find out more, and your local community police officer will be only too pleased to meet people who wish to start up a new scheme. Our new neibor has complained about our shared garage since the day she moved in. She couldn't figure how to park her car as my van was in my space but she couldn't fit, she said. She ran to mngr to tell. I showed pics of a car and my van both fighting. He made me remove my van. And now I must move my things in garage so this idiot can fit her car. Now she ran to mngr complaining of a car in her spot and 2 people in garage telling her they were doing something and to wait and then they'd move car. All lies! My daughter was taking stuff out ( as mngr asked) and her car was in lier's spot so she had a better way to load car...She moved car immediately and continued to move her things. The woman complained that there also was a" tall black man" in garage. Hello...this is an old white racist who still has fear of black people.my daughter is mixed and looks latina. I'm fed up with this crap! I had 2 neighbors before her and never a complaint! It all points to her with a problem with: a) wants garage to self b) has an issue with people of color. PS..all black mngrs have been removed and now White and Latino rule in this complex. We' be been here 2.5 yrs and I'm not backing down to this old broad or this management. I want to file a harassment suite.